The palace was built between 1773 and 1781 in braided and Rococo style by the hydrology expert and architect Gabriel Gruber, a Jesuit Viennese by origin. 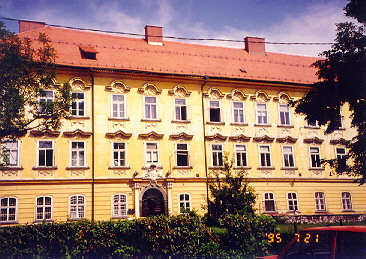 Originally it was his mansion, used for his researches in physics and hydraulics. It had also an astronomic observatory. In 1840 the palace was purchased by Anton Virant who annexed the building to another one of his property close to that one. In that period it was used as a hotel and a cafe: the name, "Zur Sternwarte" meant at the observatory. In 1887 it was bought by the Carniolan Saving Bank and now, since 1965, is the Archive of Slovenia. It has been renewed in 1990. In front of the Ljubljanica river bank we can find the nice articulated façade of this two-storeyed palace, with decorations arranged in plaits and a nobly formed stone portal. The most sumptuously decorated are the two interior areas, the staircase and the private chapel. The oval staircase in the cool light color is decorated with Baroque, braided and Rococo features. The vault over the staircase was executed in 1786 by Andrej Herrlein with the allegorical fresco of trade, crafts and and technology. The chapel of the Virgin, which has been preserved in its entirety, is one of Ljubljana's most famous monuments of the late Baroque period. Three scenes and several episodes from Mary's life were painted by J. M. Kremser-Schmidt in the grisaille technique in fresco on the walls and the vault.